Join the club and experience the great benefits of being one of our valued members! Join us on your birthday for our ‘BOTTLE OF SPARKLY’ birthday promotion. Each month complimentary wine vouchers will be sent out to members with an up coming birthday. To participate in this promotion members must take their voucher to the administration office on Level 1 for validation after which, it can be presented at the bar. Any member who does not receive their voucher or misplaces it may collect a new voucher from the administration office. Please Note: Offer is not available for ‘take-away’ and must be consumed within the Club. We are pleased to offer Members of the Club a 15% discount on the current market rates at the Castlereagh Boutique Hotel. Please show your membership card upon check in. Club Members are entitled to enjoy a 10% discount on food and beverages throughout the Club. Please present your membership card at the bars or dining room. • Earn 10 points per $1 spent within the Club. e.g $15.80 spent earns 158 points. • 1000 points must be accrued before redeeming points. • Redeem 1000 points to spend $10. • Member discounts still apply. • Bonus points available for private Member functions. 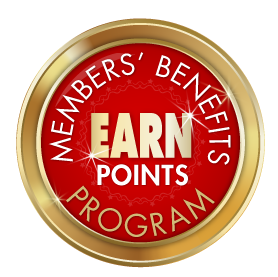 • You must present your own Member card to accrue points. Your membership of the NSW Masonic Club provides access to reciprocal clubs in Australia, and around the world. See the Reciprocal Clubs List for a full list of Australian and international reciprocal clubs.